This time we stuck to photos since the previously posted movie hasn't worked out as planned. The trip was to a Swedish ski resort called Salen, right next to the Norwegian border. Swedish resorts are at all like those in the U.S. or Canada. Not nearly as glossy, nor luxurious. However, they are much much more child-friendly. You can let your kids roam around, which is the norm. This particular resort features a long green slope roughly translated into the "Troll Path". There are a variety of amusing wooden sculptures with sounds effects etc. 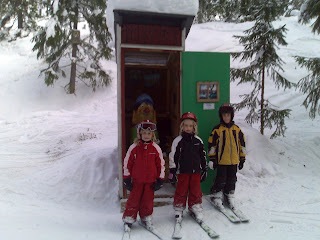 The photo of the kids is in front of a troll in an outhouse. Given all kids seeming obsession with all things "toilet" this was a big hit with the crowds of youngsters. On an unrelated note, Sofia and I were able to enjoy several lovely meals in the restaurant attached to the building our apartment was situated in. We'd sit down with the kids as they plowed through their buffet meal, after which we were able to calmly nibble away at various gourmet dishes on offer. All in all a relaxing week.